Charterhouse Bridge looks similar today, give or take a few notches out of the stonework caused by large lorries colliding with the bridge! 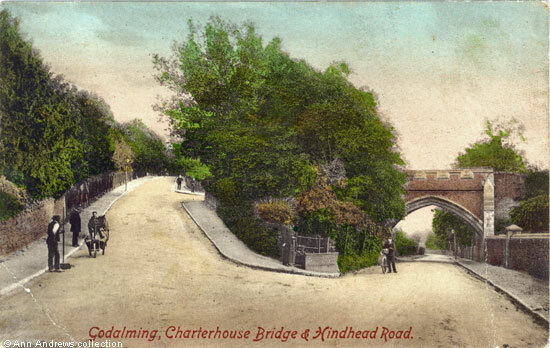 Locals these days may not recognise the name Hindhead Road as the road going up the hill past the Charterhouse school entrance (on the right, via the bridge). It is now Sellar's Hill and a grassed area blocks the road off from Charterhouse Road traffic. However, Hindhead Road used to stretch from here up to what is now Twycross Road and then along and down Frith Hill Road, joining Deanery Road. The name was changed at some stage between 1919 and 1934. The bridge is Victorian Gothic and built of Bargate stone and was initially the main entrance into the school. Charterhouse Road, which goes under the bridge, has also undergone a change of name and was called Sandy Lane until the late nineteenth century. By the 1901 census it had been renamed Charterhouse Road. 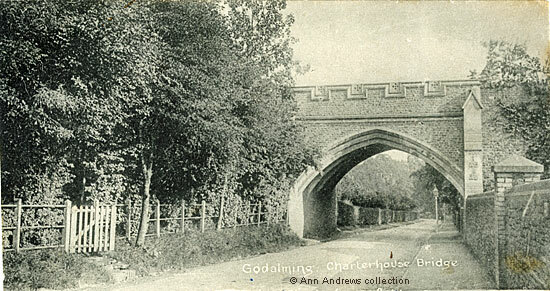 The bridge replaced an earlier bridge owned by the Land Company who were involved with the initial purchase of the school (see Charterhouse School, 1900-07) and had been used to connect the properties they owned on Sandy Lane. Some years after the school was built the bridge was transferred to Charterhouse School who knocked it down and replaced it with the present bridge, designed by the Victorian architect Sir Arthur Blomfield. According to William Veale, who was employed by the school for many years, the replacement "bridge was built in 1886. The pathway under the old one was tunnelled and separate from the road; water seeped through the [old] bridge and it became unsafe". In 1894 The Illustrated London News published a long article about Charterhouse School in its "The Great Schools of England" series. "On the east of the main block a short road leads over a bridge across another valley to a hill on which the greater number of boarding houses are placed. In the valley which divides the hills runs the road which brings one, in about a mile, to the pretty town of Godalming which is, however, out of bounds of the school being conveniently divided from it by he railroad, which acts as the only "school bounds" needed". E. M. Jameson, writing in 1937, refers to Charterhouse Road as being in a ravine. Whilst it is impossible to know who the individuals on the image are, there is at least one of the masters at the school entrance as he is wearing clerical clothes. It is possible the other person was either a senior boy or a master. The Craddock's black and white card of the bridge (below) was published a few years earlier. Interestingly, the footpath on the left had side of the road went under the bridge and then stopped. a Charterhouse School masters' house. 1. "Godalming, Charterhouse Bridge & Hindhead Road" published by F. Frith & Co. Ltd., Reigate in 1906. No. 57053. Indistinct postmark but probably posted in 1907. Sent to Miss E. Lancester at Southsea. Personal message only. 2. "Godalming, Charterhouse Bridge". Craddock's Series. Posted 31 July 1903 in Godalming. Personal message is unrelated to the picture. Postcards in the collection of, provided by and © Ann Andrews. Researched, written by and © Ann Andrews. Jameson, E. M. (1937) "Charterhouse". Blackie & Son Limited, London and Glasgow. This book was kindly loaned by Clive Carter, a former headmaster of Charterhouse. Veale, W (1957) "From a New Angle. Reminiscences of Charterhouse 1880-1945". P & G. Wells, Ltd., Winchester. "Illustrated London News", 6 October 1894. "The Great Schools of England" No. VIII.